If, for one reason or another, your photo can’t be ready by the 15th, we need to know by the 15th that the photo will be coming, and when. We prefer digital photos. Please send us the digital file just as it came off the camera. Photos from cell phones, tablets, the Web, etc. rarely work well. Please use an actual camera. In a pinch we can also use professionally-developed photos. But photos printed on your printer at home will rarely reprint well. The important thing is that the photos be clear and well-lighted. For digital photos, we need at least 1,000 pixels of resolution in at least one dimension. For older digital cameras, this may mean you’d have to use the highest quality setting. For the newest models, even a low quality setting may have the 1,000 or more pixels of resolution we need. Because of copyright issues, we usually can’t use photos that were taken by professional photographers or were taken for other publications. Be sure to tell us who took the photo. A good caption tells the reader the “who, what, when, where, and why” of the photo. Identify the people left to right, front to back. Be sure the names are spelled right! 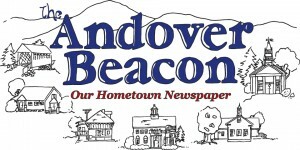 To submit a printed photo, you can either drop it off at the Town Hall (tell them it’s for the Beacon) or you can mail it to The Andover Beacon, PO Box 149, Andover NH 03216-0149. We will return it to you as soon as we can. Please don’t send photos via Web-based services like Snapfish, etc. They’re not suitable for printing. Instead, send us the actual photo file, just as it came off the camera.